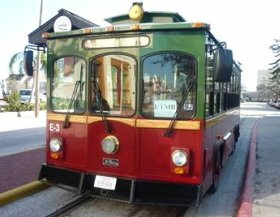 Galveston Trolley To Attraction Sites And Strand District. Galveston trolley used to be on rails but currently it has been changed to trolleys on wheels. The city will have to undertake some major repairs on the rail track before reintroducing the trolleys on rail. The Galveston Island Transit authority is responsible for the trolley route. One operates hourly from the Galveston Seawall 2100 Seawall Blvd. to the Strand shopping center on weekends only. The Other operates from University of Texas Medical Branch area to the Strand district every 20 minutes. Get on the Seawall route and take an easy and slow ride through the shopping centers. Scope all the shops and the museums to be visited later while riding on the trolley. Go through some Galveston Landmark territories like the Galveston Rail Road Museum and joyride back to the Galveston beach. 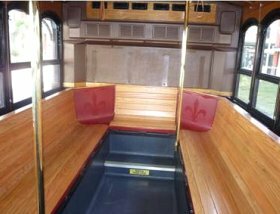 Try the other trolley ride through the UTMB area. Take a tour of the huge medical school. Vacation travel to Galveston in summer weather can be warm but be assured that a jacket might be needed in the trolley. The air condition cooling system is very good. and the Harbor House Galveston are not far from the Trolley stop. These are excellent places to stay. Do inquire about them or the other nice hotels and vacation rentals in Galveston.